If you love Scooby-Doo, that goofy, courageous hound with the super-sized appetite and the super-sized smile, then you share something special with most of the seven billion other people on this planet. And if your enduring love for Shaggy's "ol' buddy ol' pal" has made you hesitate to watch Warner Bros. Animations' latest revamp of the world's favorite cartoon dog, I understand. The live action movies have been unwatchable. I've heard people say they'd prefer a root canal to another live action Scooby-Doo film. 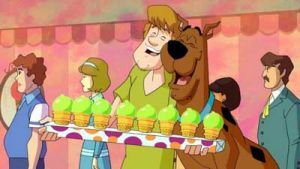 But in the hands of series creators Joe Ruby and Ken Spears, the brand-new animated Scooby-Doo! Mystery Incorporated is wonderful. Imagine those meddling kids are still in high school. They're already the best of friends, going everywhere together in Fred's brand-new Mystery Machine. They look just the same. Their lines are more precise, and Velma has more expressive eyes behind those glasses, but otherwise all odious "updating" was thankfully avoided. In fact, the unique and idiosyncratic clothing choices of these kids, like Shaggy's baggy bell-bottoms and Fred's ascot, provide fodder to running gags. In nearly every way, Scooby-Doo! 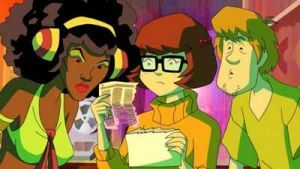 Mystery Incorporated preserves everything that was good about the original series (1969-1972) while adding depth and dimension to the characters, and mysteries within mysteries for a smarter audience. There are so many things to love about this reboot. I love the constant punning, like when a teen-aged girl is accused of being crabby just before being attacked by a giant crab, while all along the show is poking gentle fun at teen obsessions with looks and fads. (The gang, of course, is oblivious to looks and fads, part of the fodder for many jokes about high school society.) At the same time, the show offers genuinely compassionate portrayals of the insecurities involved in growing up, and the courage with which these kids face them, along with the loyalty they show each other. The major innovations of the show provide each episode with a new level of complexity in story-telling and humor. Velma and Shaggy are a couple, but keep their feelings hidden because Shaggy doesn't know how to tell Scooby. Impatient Velma, nervous Shaggy, and confused Scooby combine to make a really funny, and true-to-young life love triangle. Daphne has just about the biggest crush ever on completely clueless Fred. Fred really has only one true love: his traps. Fred is absolutely fascinated by traps and builds utterly inefficient traps with Rube Goldbergian complexity that still somehow work – even if they don't always catch the bad guy. I loved seeing Fred at the bikini volleyball tournament, swooning over the nets and dreaming about their tensile strengths while Daphne sat next to him, wondering how she could ever compete. Meanwhile, Daphne is a born sleuth, brave and smart. She works alone with superior instincts for danger and for clues. There is more action in this series than in the original, and the action scenes are wonderfully choreographed. There are far more characters than in the original, thanks to a hilarious supporting cast. The kids all live in Crystal Cove, "The Most Haunted Place on Earth," a town which makes its money on tourists interested in a little supernatural chill. 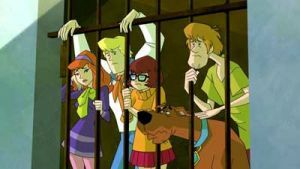 As a result, the gang's interest in solving mysteries is rarely welcomed by the Sheriff, Fred's father the Mayor, and Velma's parents, curators of the town's museum of spooky artifacts. There are far more settings and a much richer palette than in the original, and I particularly love the show's use of potent color contrasts to accentuate the interplay of dark and light. Here's one thing that hasn't changed a bit: the creatures are still people in costume. They are still motivated by less-than-noble impulses, like greed, power, and revenge. In short, there is nothing supernatural here! The show has the ability to teach the scientific method: observe, hypothesize, test, discuss. It's great to have the inquisitiveness and empiricism of the original series back. In addition, the kids hang out at K-Ghoul, the town's radio station, with a hip disco-era throwback named Angel. Angel helps with research, and has a hidden agenda. Meanwhile, the mysterious "Mr. E." (say that out loud really fast) sends them clues and hints about a larger mystery, a mystery embedded within the mysteries the kids solve each episode. I love hearing Velma say "Jinkies!" and Shaggy exclaim "Zoinks!" The only thing I really don't like about the show is the soundtrack. It sounds really canned. The theme song, if you can call it that, falls sadly short of the original song, one that parents, kids, and even grandparents still sing together. And the music during the individual episodes hints around at the old horror-style weird organ music, but it just doesn't work. This is the same problem the old series also failed to solve, and that reached its nadir in What's New, Scooby Doo? But what a tiny flaw in a show that is otherwise an absolute delight from beginning to end. It's truly all-ages. It teaches awesome values about friendship, loyalty, and understanding. It truly believes that these things are more important than money. It shows how clear thinking and courage are enough to reveal the non-scary thing lurking behind your deepest fears. It shows that by working together, you can overcome any obstacle. It proves that supernatural phenomena have natural causes. It demonstrates that you don't have to be the victim of people who would exploit your fears for their personal gain. It hits all the right notes at a critical moment in American culture. I love this show! Set your DVR! Cartoon Network will rebroadcast the first eight episodes on Saturday, September 4. Here's your chance to experience one of the best series reboots you'll ever have the pleasure to watch.